And yet, even after decades of research and observations, there is still much about our galaxy astronomers do not know. For example, they are still trying to determine how massive the Milky Way is, and estimates vary widely. In a new study, a team of international scientists presents a new method for weighing the galaxy based the dynamics of the Milky Way's satellites galaxies. 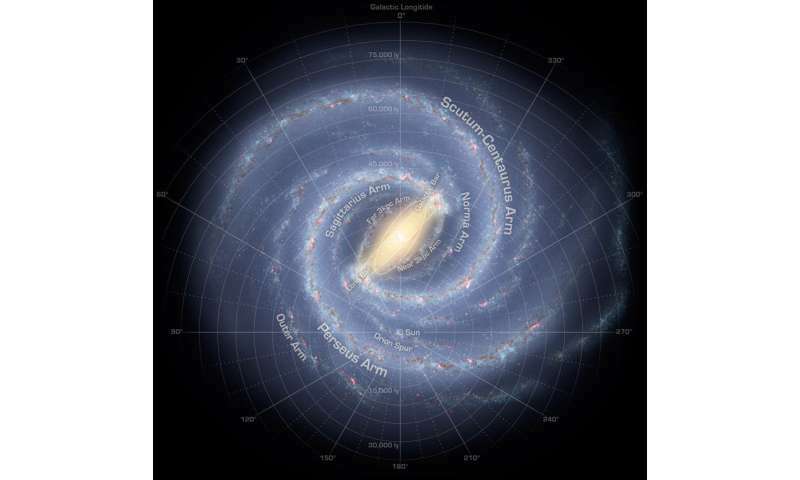 The study, titled "The mass of the Milky Way from satellite dynamics," recently appeared in the Monthly Notices of the Royal Astronomical Society. The study was led by Thomas Callingham from the University of Durham's Institute of Computational Cosmology, and included members from the Massachusetts Institute of Technology (MIT), the Heidelberg Institute for Theoretical Studies, and multiple universities. As they indicate in their study, the mass of the Milky Way is fundamental to our understanding of astrophysics. Not only is it important in terms of placing our galaxy into the context of the general galaxy population, but it also plays a major role when addressing some of the greatest mysteries that arise from our current astrophysical and cosmological theories. These include the intricacies of galaxy formation, discrepancies with the current Lambda Cold Dark Matter (Lambda CDM) model, alternative theories on the nature of dark matter, and the large-scale structure of the universe. What's more, previous studies have been hampered by a number of factors, which include the fact that the Milky Way's dark matter halo (which makes up most of its mass) cannot be observed directly. "The majority of the galaxy is in its dark matter halo, which cannot be directly observed. Instead, we infer its properties through observations of various dynamical tracers that feel the gravitational effects of the dark matter – such as stellar populations, globular clusters, steams and satellite galaxies. Most of these lie at the center of a our galaxy in the the galactic disc ( within ~10kpc) and the stellar halo (~15kpc) which can give good mass estimates of the inner region. 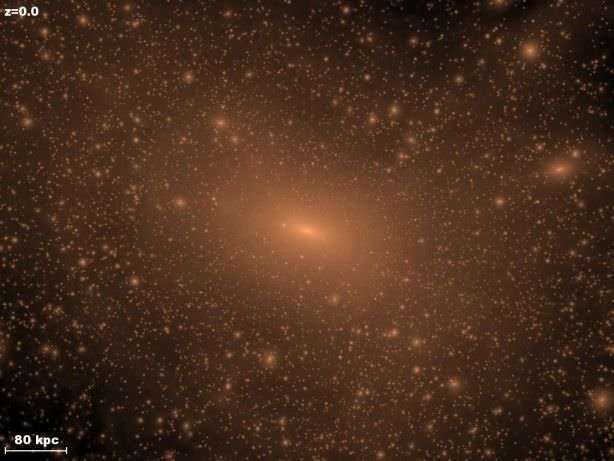 However the DM halo reaches ~200kpc, and for this reason we chose to focus on satellite galaxies, as one of the only tracers that probe these outer parts of the galaxy." 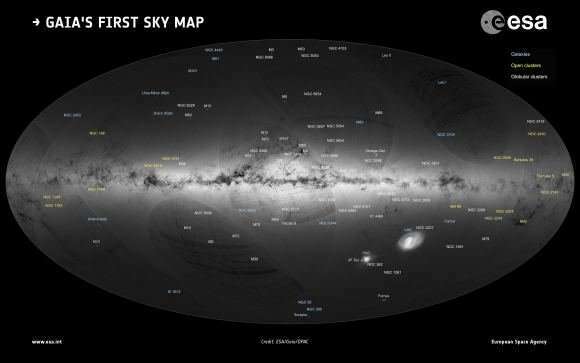 The Gaia mission’s first sky map. Credit: ESA / Gaia / DPAC / A. Moitinho & M. Barros, CENTRA – University of Lisbon. "We compare the orbital properties Energy and Angular Momentum of the MWs satellite galaxies to those found in simulations. We used the latest observations of the MWs satellites from the recent Gaia DR2 dataset and a sample of suitable galaxies and satellite galaxies from the EAGLE simulations, a leading simulation ran in Durham with a large volume and full hydrodynamical baryonic physics." The EAGLE software (Evolution and Assembly of GaLaxies and their Environments), which was developed by Durham University's Institute of Computational Cosmology, models the formation of structures in a cosmological volume measuring 100 Megaparsecs on a side (over 300 million light-years). However, using this software to infer the mass of the Milky Way presented some challenges. "A challenge to this is the limited sample of MW size galaxies in EAGLE (or indeed any simulation)," said Callingham. "To help this we use a mass scaling relation to scale our total sample of galaxies to be the same mass. This allows us to effectively use more from our dataset and greatly improves our statistics. Our method was then rigorously tested by finding the mass of simulated galaxies from EAGLE and the Auriga simulations – an independent suite of high resolution simulations. This ensures that our mass estimate is robust and has realistic errors (something the field sometimes struggles with due to analytic assumptions)." "A tighter mass estimate can be used in many ways. In galaxy modelling, the DM halo is the backdrop on which stellar components are fit. Many methods to probe the nature of DM, such as the structure of the DM halo, as well as the density of DM on Earth for direct detection purposes depend on the mass of the MW. The mass can also be used to predict the number of satellite galaxies around the MW that we expect." 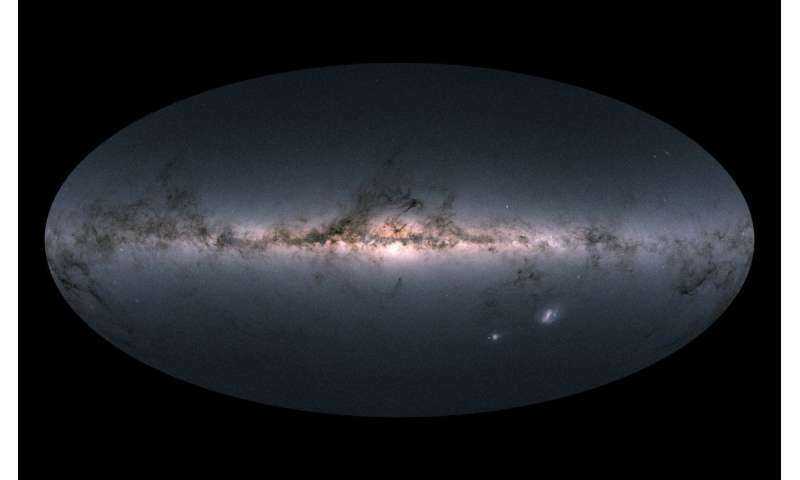 In addition to providing astronomers with refined measurements of the Milky Way's mass – which will go a long way towards informing our understanding of its size, extent, and satellite galaxy population – this study also has implications for our understanding of the universe as a whole. What's more, it is yet another groundbreaking study that was made possible through Gaia's second data release. The third release of Gaia data is scheduled to take place in late 2020, with the final catalog being published in the 2020s. Meanwhile, an extension has already been approved for the Gaia mission, which will now remain in operation until the end of 2020 (to be confirmed at the end of this year). My oh my - Universe Today is certainly pushing Dark Matter hard, as though it is a real component of galaxies. It isn't. If Dark Matter was real instead of just light reflecting off small pieces of normal Matter floating in Space, it would be subjected to gravitational attraction/pull which would pull the DM together enough to compress it. Supposedly, DM interacts with normal Matter. But if so, then it should be seen and not remain supposedly invisible. The photo shows the "Dark Matter halo" to more resemble a dissipating smoke. Perhaps that "smoke" is caused by the heat from all of the Stars in the vicinity. How would you know? I thought you were here to learn! Your idea of learning is telling real scientists that they have got it all wrong? Pull the other one - you are just another anti-science troll. And what the hell is that supposed to mean? If it was visible due to light reflecting off anything, it wouldn't be bloody well called dark matter, would it? And before anyone refers to the last image in the article - that is a computer sim. Hah Pull the other one, jones says. I see that you are copying off your master, Captain Chickenshit's wordsalad. Well aren't you the stupid one. Read what I said again, won't you? I said that the DM "halo" looks more like dissipating smoke, possibly from heat emitted from the Stars. Physicists are certain dark matter exists, having inferred this existence from the gravitational effect dark matter has on visible matter. What they are less certain of is how dark matter interacts with ordinary matter -- or even if it does. On the one hand - "...having inferred this existence from the gravitational effect dark matter has on visible matter." But on the other hand - "assumes dark matter "talks to" normal matter -- that is, interacts with protons and neutrons -- by means other than gravitational interaction (just gravitational interaction is not enough)." Is this not, as they say, gobbledegook? dark matter interacts with protons and neutrons BY MEANS OTHER THAN gravitational interaction. So what is the REAL story here? Scientists are struggling to provide new answers to what is seen in visible light as a "halo" encircling galaxies. And it seems that they may be avoiding a more common sense answer that the "halo" is merely EXCESS dust and gas that have pulled together gravitationally into a disk around the galaxy, rather than disperse into the space between galaxies. It is so obvious what the "halo" really is - but it is easier to take the long and more difficult road, that is, the roundabout way before coming back to the truth of the matter. This is a common misunderstanding of what astronomers mean by a "halo". A halo is something that permeates AND extends beyond the rest of the galaxy. See Figure 2 at the end of https://arxiv.org...9478.pdf to see that, in fact the density of DM is greatest AT THE CENTRE OF THE GALAXY. The Milky Way also has a stellar halo. This doesn't mean that halo stars are confined outside the galaxy, there are many within the galaxy. It is simply that they are ALSO distributed beyond the rest of the galaxy. (See phys.org article https://phys.org/...lge.html which states "halo stars pass through the solar neighbourhood"). Nice to see less error (and a hefty mass to the Milky Way). @SEU: "Scientists are struggling to provide new answers to what is seen in visible light as a "halo" encircling galaxies." No,they are not struggling in this area, that is the point, the standard (dark matter) cosmology works best on all scales the last 5-ish years. Alternatives are "a dead parrot". The search for better observations and more constraints on dark matter is a side issue - which is why you grasp for it - dark matter is still "dark" (and particulate). You aren't seeing anything. Dark matter is..................dark! That is a computer simulation. They couldn't really show the dark matter as dark, as you wouldn't bloody well see it! Stop putting your foot in your mouth.